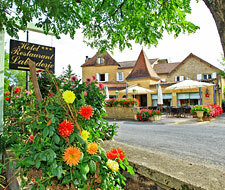 The Hotel-Restaurant Laborderie is a 3 pot – 3 fireplace Logis de France, traditional and family hospitality, located within a stone’s throw of the medieval city of Sarlat, in a verdant area, on the top of a hill which overlooks the valley of the Beune, at the heart of one of the most beautiful villages in the Périgord Noir. Welcome, a family story here! The Laborderie family greets you in accordance with the tradition of hospitality that characterises le Pays de l’Homme (Prehistoric Land of Men), in an authentic Périgord setting.